The following is excerpted from an article by Michael P. Rucker entitled "High Water on the James;" it appeared in the Rucker Family Society Newsletter, vol.15, number 1, March 2004. The first batteau was launched in 1775 by brothers Anthony and Benjamin Rucker of Amherst County, Virginia, an event witnessed by their friend and neighbor, Thomas Jefferson, of nearby Poplar Forest. Mr. Jefferson's account reads: "Rucker's battoe [sic] is 50 f. long, 4 f. wide in the bottom & 6 f. wide at the top. She carries 11 hhds. [hogsheads of tobacco] & draws 131/2 [inches] water." Two hundred years ago, before paved roads and railways, the James River was the main thoroughfare between the tobacco fields of central Virginia and the Richmond market. Before the Rucker brothers invented and patented the batteau, farmers used oxen to pull individual hogsheads over the muddy "Rolling Road," or loaded several barrels onto double dugout canoes. The sleek, keelless, flat-bottomed batteau of the Ruckers was a vast improvement, allowing greater payloads and larger profits. Tobacco, wood, coal and apple brandy made the trip downstream to Richmond's Great Basin, where the batteaus were reloaded with cargo to fill the plantation owner's shopping list. The arduous upstream return trip, the boatmen poling against the current, was so time-consuming that once a canal system and railroads were developed, it became more profitable to burn or sink the batteaus once they arrived in Richmond, and build new ones to transport the next season's harvest. The double-ended batteau has neither bow nor stern, and appointed with rudders (sweeps) on both ends, it is able to spin on its flat bottom as the crew directs it around obstacles in the sometimes rapid current. Slaves and indentured servants manned the batteaus, and were treated very well to insure the safe transport of what was the lifeblood of the plantation. These proven and trusted boatmen manned more than 500 batteau crews, so it is not surprising that stories of disappearing pigs and chickens circulated among the folk living along the river's banks. The days of the Rucker batteaus are celebrated every year at Lynchburg's Batteau Festival. 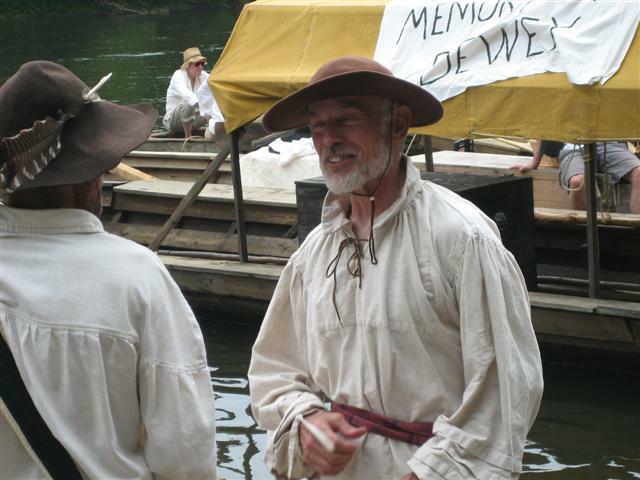 Reproduction boats, crewed by costumed reenactors, leave the city to float down the James to Richmond, stopping in small towns for a week-long floating history lesson. The 2004 Rucker Family Society reunion was held in conjunction with that year's Batteau Festival, and all attendees agreed that the boatmen (and boatwomen) were worthy inheritors of the traditional craft invented by our Rucker ancestors. For more reading, Smithsonian magazine, June 2002, treats the batteau in "Poling on the River."